CHARLOTTE, N.C. -- With 670 miles of wire and cable and 487,000 solar panels, Duke Energy's (NYSE: DUK) 40-megawatt (MW) Elm City Solar Facility is the latest addition to the company's renewable portfolio to power a clean energy future. Duke Energy, Wilson County and Elm City officials will kick off the completed project at an event Thursday morning. The plant began operations in March and is currently supplying energy to customers. 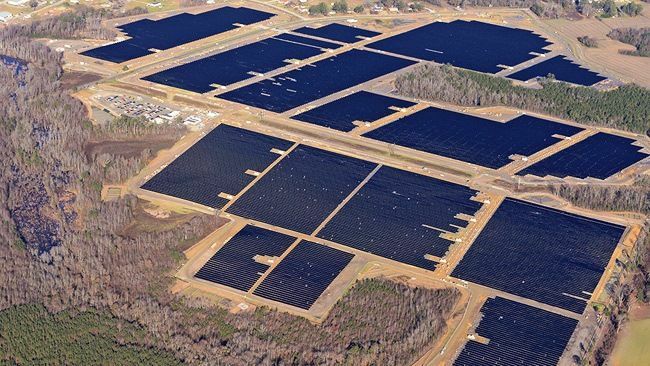 The facility is the newest solar site that Duke Energy owns and operates in North Carolina. Overall, Duke Energy has 35 solar facilities across the state. "Duke Energy has embraced solar energy in North Carolina as a means of providing even more renewable resources to our customers," said David Fountain, Duke Energy's North Carolina president. "We continue to push for projects that promote new and renewable technologies, while keeping rates below the national average." The Elm City Solar Facility is located at 4579-4699 Haynes Road in Wilson County. Its expected annual output of 82,000 megawatt-hours is roughly what 7,000 residential customers would use in a year. In the past year, Duke Energy's retail electric companies have completed solar projects in Bladen, Duplin and Onslow counties. Construction will begin soon on projects in Davie and Monroe counties. The company's commercial business unit, Duke Energy Renewables (DER), recently purchased six solar facilities in Bertie, Edgecombe and Northampton counties. DER has solar and wind facilities in 13 states. In 2015, Duke Energy added 300 MW of solar energy in North Carolina. In total, Duke Energy companies have installed about 450 MW of solar energy in the state, enough to power 85,000 average homes at peak production. Duke Energy has invested more than $4 billion in renewable energy since 2007 and plans to invest about $3 billion over the next five years. Media members are welcome to attend the event and tour the solar site at 10 a.m. Thursday in Elm City. Contact Randy Wheeless for details – randy.wheeless@duke-energy.com.